On the auspicious occasion of the National Youth Day synchronizing with the 155th Birthday of the Patriot-Saint of modern India, Swami Vivekananda, as well as to commemorate the 125th year of his Chicago address at the Parliament of Religions, a day-long Music Festival was jointly organized by Sangeet Natak Academi, Ministry of Culture (Govt. 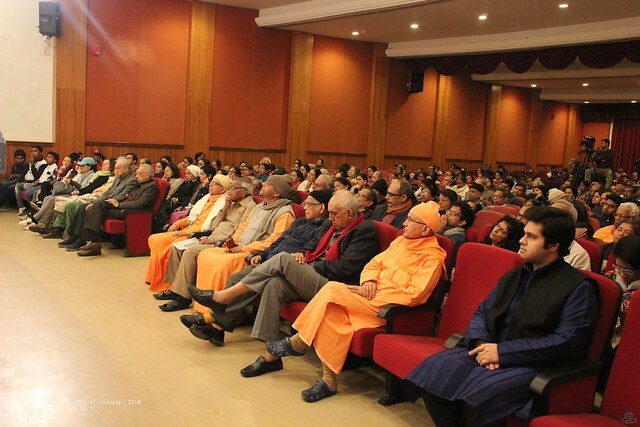 of India) and Ramakrishna Mission, New Delhi, on the 12th January 2018 in the Vivekananda Auditorium of the Ramakrishna Mission. 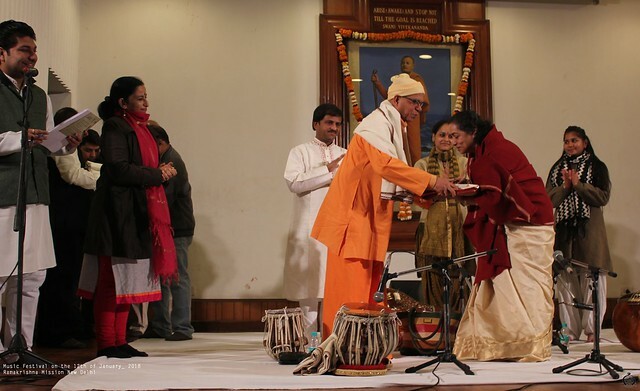 The function was a fitting tribute to the patriot saint who was himself an accomplished musician – a vocalist adept in Khayal/Dhrupad, Bhajans, Rabindra Sangeet, Bhrahma sangeet, etc., a Tabaliya, and Pakhawajiya, a composer, writer of lyrics and all other aspects of music and musicology. 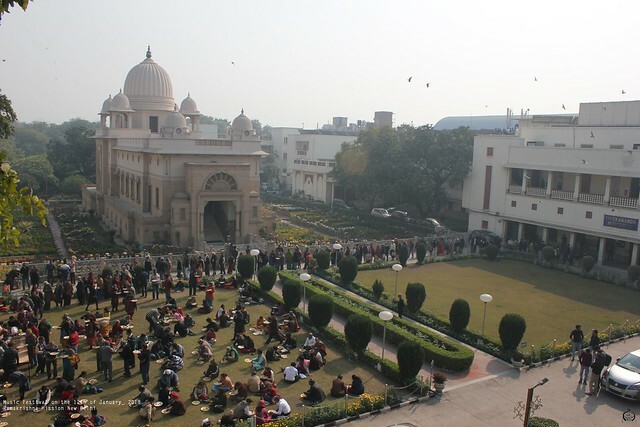 Hence it is the tradition of Ramakrishna Mission Centres like in Gol Park, Kolkata, and New Delhi to pay their homage to the great saint through day-long music. Accordingly, on 12th January 2018, with the announcement made by Shri R.J. Rahul of Akashvani, Delhi, the programme started at 10.00 a.m. with its inauguration by Revered Swami Shantatmanandaji, Secretary, Ramakrishna Mission, New Delhi, who delivered his Inaugural and Welcome Address. 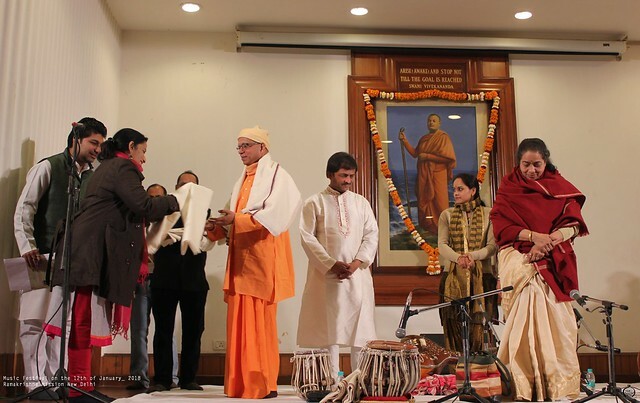 He stated that since Swami Vivekananda was a great musician, he had seen that well-known artists performed every year near Swamiji’s ancestral house in Kolkata on the occasion of National Youth Day which commemorates his birthday. 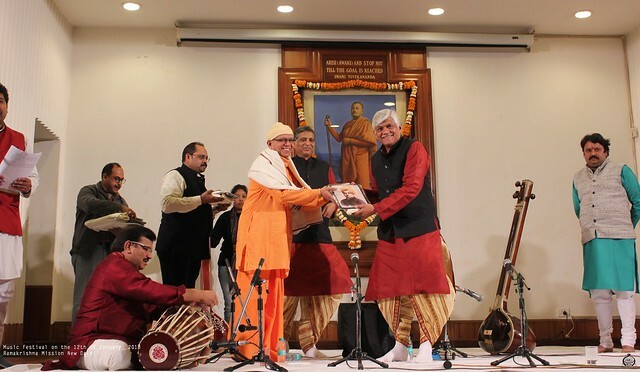 Accordingly, it was decided to organize similar musical programmes with the assistance of Sangeet Natak Academy on this auspicious day in Delhi Ashrama too, and it was started in 2017 with the tradition continuing this year. In addition, this year happens to commemorate the 125th year of Swami Vivekananda’s historic address at the Parliament of Religions at Chicago in 1893. The first session of the music programme started at 10.30 a.m. with the Hindustani Vocal recital by the well exponent of the Jaipur-Atrauli Gharana and presently the Vice Chancellor of Bhatkhande Sangeet Vishwavidyalaya, Lucknow, Vidushi Shruti Sadolikar Katkar, accompanied by Dr. Vinay Mishra on harmonium, Shri Vinod Lele on tabla, and Sushrees Geeta Bisht and Meenakshi on tanpura. Smt. Katkar began her programme with Raga Todi in which she presented a vilambit khayal in ektal “Daiyya Baat Dubhar” followed by the oft-heard bandish “Langar kankariyan ji na maaro” set to drut teental. This was then followed by a Haveli Sangeet composition in Raga Vibhas “Hey Shyam” set to madhyalay jhaptaal. What followed next was a short composition in Raag Jaijaiwanti Bilawal which appeared to be an amalgam of the night raga Jaijaiwanti and morning raga Alhaiya Bilawal. On popular demand, she ended her programme with a couple of bhajans by Meerabai and Soordas in the Ragas Bhatiyar, Maand, Mishra Pilu and Mishra Khamaj. The concluding piece, “Prabhu Mere Avaguna Chita Na Dharo” coincidentally reminded one of the incident in the life of Swami Vivekananda where he was implored by the courtesan in the Durbar of the Raja of Khetri not to look at her evil qualities. All the artists rendered soulful performances which thralled the audience. The first part of the programme ended at 12.35 p.m. 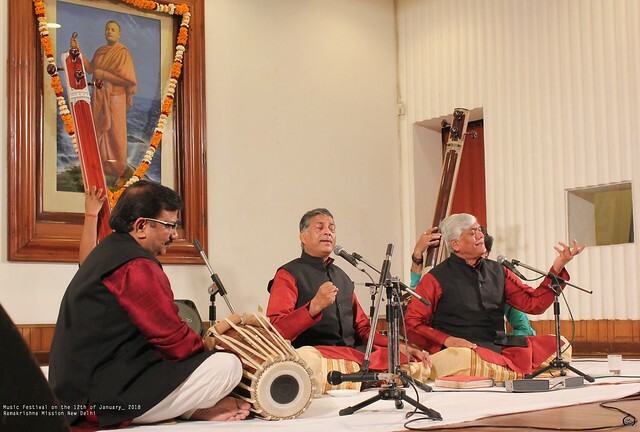 The second session started at 1.15 p.m. with the renowned Gundecha brothers – Umakant and Ramakant who gave a scintillating performance of Dhrupad. They were accompanied on the pakhawaj by Akhilesh Gundecha. 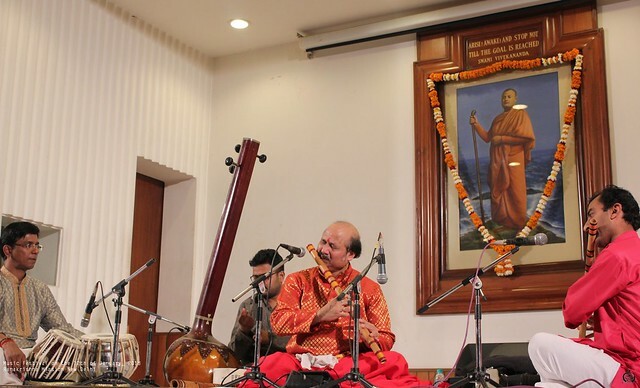 Followers of the age old Dagarvani tradition of Dhrupad-Dhammar of the Zia Mohiuddin and Zia Fariuddin Khan Dagar school, the duo from Bhopal began their recital with the afternoon melody Raga Multani. 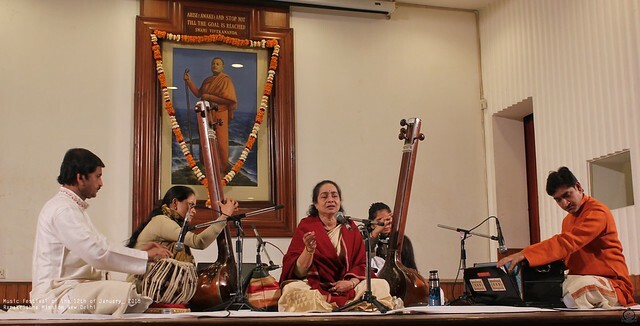 The second Dhrupad “Devi Dayani, Durga Bhavani, Kato Bandhan Tarini Simhavahini Asuramardini, Savadukhaharini Bhayabhavatarini” was a plea to the Mother Goddess to break our bonds of Maya which leads to worldly sorrow. They concluded their recital with a short alap and a Dhrupad in Raga Patdeep. The third and last session featured the internationally acclaimed flutist Pt. Ronu Majumdar of the Maihar Gharana who had learnt from maestros like Pt. Vijay Raghav Rao and Pt. Ravi Shankar. He was accompanied on the tabla by Durjay Bhowmick. The artist commenced his recital with Raga Brindavani Sarang, followed by short pieces in Hamsadhwani and Manjh Khamach, and lastly a Raag Mala with Mishra Pilu. All the artists of the day-long programme had given outstanding performances in their repertoires which had held the audience in rapt attention. At the end of each recital, Revered Secretary Mj. spoke a few words of appreciation for the performers and presented a shawl to the main artist, and a laminated photo of Swami Vivekananda to each of the other accompanying artistes.